Welcome to Building Wellness™ a youth health literacy program! Building Wellness™ and its curricula endeavor to encourage and empower children to seek, question, process and integrate health information so as to obtain the highest standard of health. With family and community support, the program seeks to support students’ self-efficacy and sense of well-being in conditioning their lives to extend their ambitions and fulfill their aspirations. Building Wellness is an 8-level youth health literacy curriculum series that offers 15 lessons per level targeting grades 1-8. 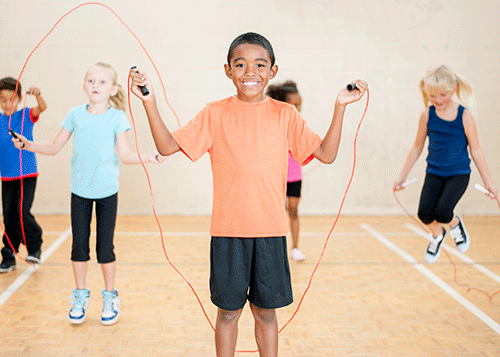 This free resource teaches students the skills they need to be active participants in their health care through experiential learning that is aligned with the Common Core State Standards. Hundreds of youth have participated in Building Wellness from New York City to Los Angeles. Assessments have shown that participants increase their knowledge levels and change behaviors based on the lessons in these 8 levels. To learn more about the early development of Building Wellness, you can review an article published in the Journal of Health Communication, The Development of Building Wellness™, A Youth Health Literacy Program. Understand how this information affects their health and their individual decision making. These goals will be met through interactive lessons meeting the Common Core State Standards concentrating on prevention of hospitalization due to asthma, accidental injury, overweight and obesity, and drug and alcohol use. Facilitators use an easy-to-follow guide that provides goals and objectives, vocabulary and a script to teach lessons covering a wide range of important health topics from hand-washing to healthy eating to internet safety. Each level has a complimentary Materials Book that provides all necessary information and student worksheets. Building Wellness™ was conceived by and its curricula was developed under the auspices of the Eugene M. Lang Foundation with the cooperation and support of educators, community organizations and health care providers, including Dr. Rima Rudd and Adeline Azrack from Harvard University’s School of Public Health. The “I Have A Dream” ® Foundation now owns and operates this curriculum. Adolescence is a stressful period and marks a transition from childhood dependency to adult independence. One major challenge that adolescents encounter involves acquiring a sense of personal agency—the capability to originate and direct actions for a given purpose. For health literacy education to make a difference, it must include the cultivation of both self-efficacy (one’s effectiveness) and personal agency.2 Building Wellness™ aims to build self-efficacy and personal agency at a young age to prepare youth for this transitional period. The difference between health education and health literacy education is that while both involve the communication of health information and knowledge, only health literacy education incorporates the development of self-efficacy and personal agency which are necessary for the meaningful implementation of health knowledge. All of these data suggest that if schools make health literacy a regular part of its educational support programs, students will gain advanced health knowledge, health literacy skills, self efficacy, and personal agency and will enjoy better health. Healthy students are more likely to stay in school and achieve their educational and career goals. 4 Educational Testing Services: Literacy and Health in America (2004). Quote, p. 3. A copy of this document is available online at www.ets.org/research/pic. 5 Rudd, RE. Health literacy skills of US adults. Am J Health Behav. 2007 Sep-Oct; 31 Suppl 1:S8-18. Building Wellness™ was conceived by the Eugene M. Lang Foundation in 2013. Its programs were developed under the auspices of the Foundation with the cooperation and support of educators, community organizations and health care providers. On January 1, 2016, the Foundation transferred ownership and operation exclusively to The “I Have A Dream” Foundation. This volume is the property of the “I Have A Dream” Foundation. Its contents are subject to copyright regulations and may not be reproduced without permission.